This guest post comes from Robyn Embry, a local pro downhill racer living in Kings Beach, California, for the past seven years. She can be found climbing rocks and skiing powder when not enjoying life on two wheels; her blog http://therobynator.blogspot.com contains the extended version of this and other adventures, including the fun and tribulations found within a season of mountain bike racing. 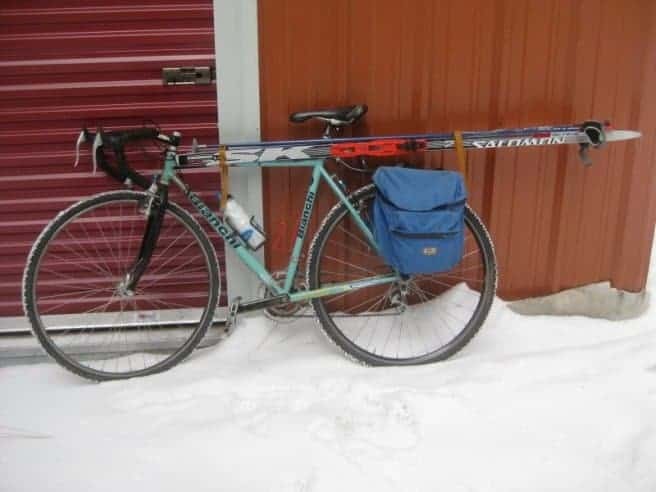 My favorite mode of transportation no matter the season! 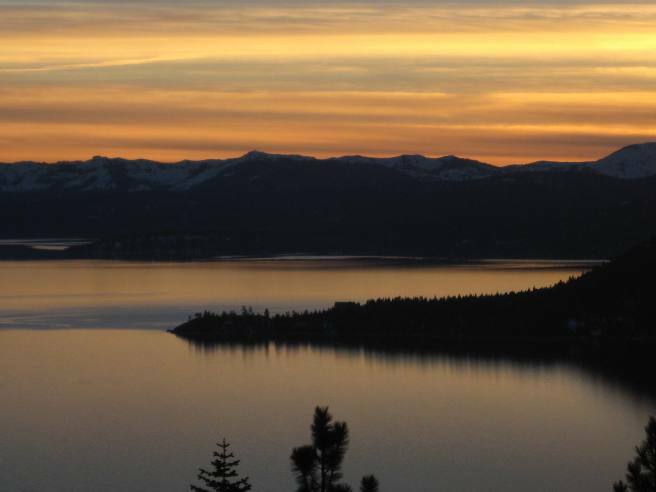 Some years, winter in Tahoe is an endless series of blizzard storm days and bluebird powder days. Other years, like this one, it sometimes becomes a challenge to enjoy winter without endless powder–for those without a proper variety of activities to choose from, at least. 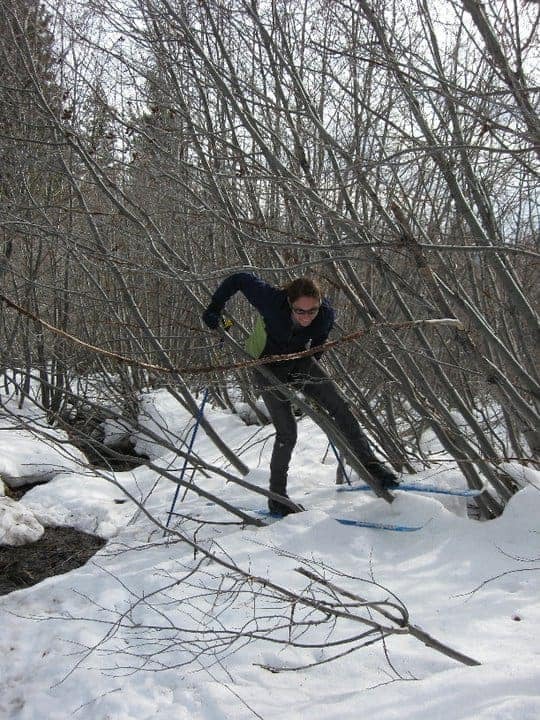 One favorite activity, given that there is still enough snow on the ground, is cross country skiing. This may conjure up images of spandex-clad racers striding down a perfectly groomed trail, but my version doesn’t require a trail pass or aerodynamic clothing. I simply strap my skis to my bike for a short ride to the National Forest above Kings Beach (They don’t groom here much like they do at Royal Gorge – more info below). Sunset view, taken from my touring skis. Braving ungroomed terrain on skinny skis can range from relatively tame, to hilariously entertaining and even slightly terrifying, depending on chosen terrain and snow conditions. For the seasoned alpine or telemark resort skier there’s nothing too difficult – just swallow your pride and make a wedge (“Pizza! Pizza!”) if all else fails. Other variables include the number of snowmobile or posthole tracks that crisscross the woods, and bare spots or manzanita bushes lurking just beneath the snow. Slightly wider skis and metal edges can give more control, but just about anything goes since it’s all about having fun. The afternoon’s soft corn it is quite pleasant for traveling up and down a variety of slopes, but when the sun starts going down and re-freeze occurs, dodging trees on a 20-degree slope can be very exciting. So watch that sun and make sure there’s plenty of time to get back to the trailhead! Regardless of the skiing conditions, I’ll always come flying down to the road with a huge silly grin and no regrets about spending an afternoon puttering in the woods on skinny skis. Getting adventurous in the backyard! When my mom, an avid Nordic skier, comes into town to visit, she prefers to stay on the groomed trails and likes to visit the Royal Gorge’s expansive and scenic trail system. Two weeks ago she flew down from Washington state, and we were booked for two nights at the Clair Tappaan Lodge up near Soda Springs. They offer close accommodations to the ski area. Having been there several times before, we looked for a loop that we had not done yet, but settled on the Devil’s Peak viewpoint the first day. We had previously done it on a stormy day with no views, and wanted to enjoy it on a clear day. That was a nice mellow intro to striding in the tracks for me this season, and an altitude acclimation day for Mom. The scenery was incredibly beautiful and the track was fun and rolling almost the entire way. Our only mistake was taking the Sleigh Ride trail to return to the lodge, which was such an incessantly steep climb that we both regretted making that sort of decision toward the end of our ski. Fortunately it didn’t wear us out too much, so the next day we chose a loop up to Lola’s Lookout, one of the highest points in the trail system. 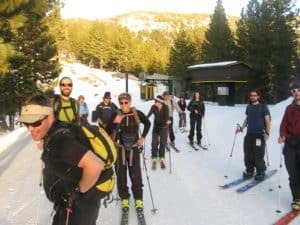 It turned out that the previous day’s climbing was a great warm up for this loop, as we ascended some more difficult trails to reach the high point with stunning views of the American River Canyon, Sugar Bowl Ski Resort, and surrounding peaks. There remains one scenic loop we haven’t yet been to out on the west side of Devil’s Peak, and that one will have to be left for next time. After all, it is the farthest-out point on the entire groomed trail system. Another track system at Royal Gorge is the Van Norden Meadow, where the Sugar Rush 16-kilometer nordic ski race will be starting and finishing on March 17th; this will be the first competition to be held at Royal Gorge since Sugar Bowl began managing the resort this season. It’s sure to be a fun event, so head over to spectate and explore some new trails – or join in the race! Just before we headed up to Royal Gorge I had seen that Tahoe Mountain Sports was putting on a “Nachtspektakel” ski tour and dinner event at Diamond Peak Ski Resort. 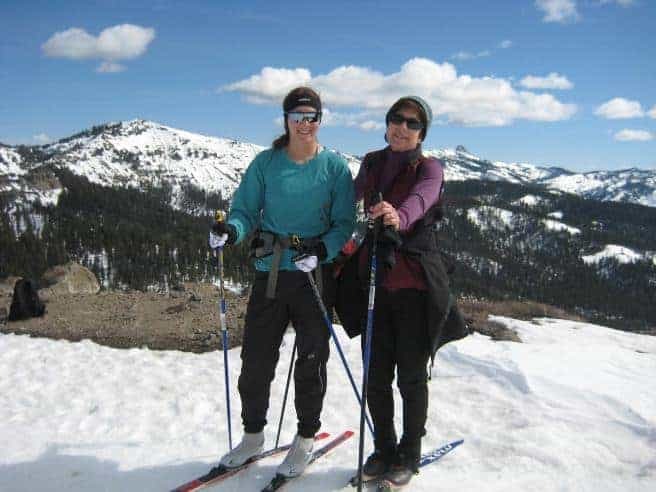 Knowing how amazing the view would be from the Snowflake Lodge, I decided Mom would be able to handle the relatively easy skin up, despite never before using backcountry touring skis. It sounded like it would be a memorable and fun event with some good friends, and a chance to meet other backcountry skiers in the community. That’s not even half our group of uphill “tourists”. Much cooler than going out to dinner at the same old Tahoe restaurants! There was a bit of a scramble initially as Kit forgot his skins, but Dave from TMS came prepared with extras for him to borrow. Coming from sea level, the altitude slowed Mom down a little skinning up, but she persevered and made it with plenty of time to relax and watch the sunset show. Dinner was delicious and further entertainment was provided by the raffle and a few rounds of the shot-ski before buckling our boots for the ski down. A freshly groomed trail awaited us, and the group started down with headlamps glowing. Skiing down in the dark was really cool – not scary at all, so even Mom enjoyed it! I’m so happy that this coincided with her visit and that we were able to do something unique to finish off her trip. Thanks again to Tahoe Mountain Sports for putting together such a fun event! 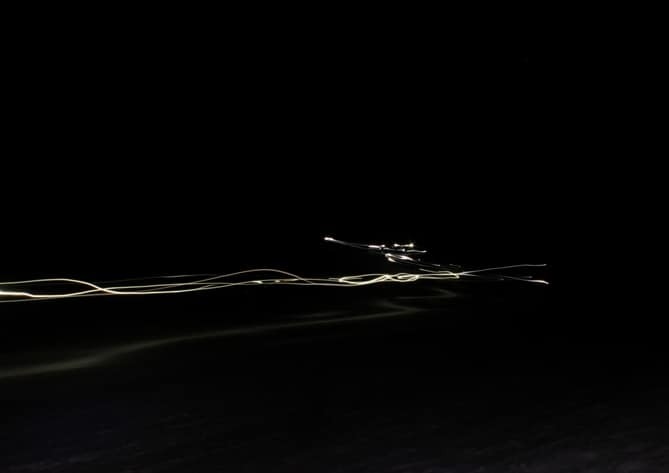 Guided by only headlamps, thirty skiers descend Diamond Peak after dinner and drinks.